Source: Donald E. Dsborn, Sacramento Municipal Utility Distric, Jan 2000. All cost in per kW (PTC;A/C). Energy cost levelized over 30 years at District cost of money or 1st mortgage rate. 2. พลังน้ำ ขนาดกลาง-ใหญ่ (5-180 MW) 1.16 กฟผ. 3. 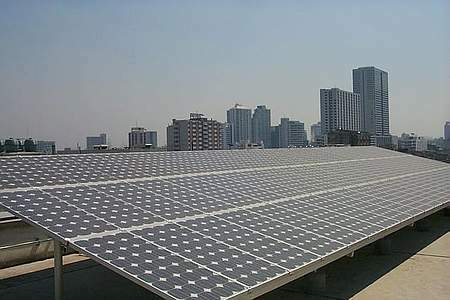 พลังความร้อน (25-600MW) 1.52 กฟผ. 4. พลังความร้อนร่วม (60-250 MW) 1.54 กฟผ. 5. กังหันก๊าซ (14-122 MW) 2.82 กฟผ. 12. มาตรการการจัดการ ด้านการใช้ไฟฟ้า (DSM) 0.5 โดยสำนักงาน DSM ของ กฟผ. “Sharp Solar Cells for Terrestrial” Electrinic Components Sales Dept. Sharp Corporation Japan. “Renewable Energy World” Vol.2 No.6 November 1999, James & James LTD, UK.